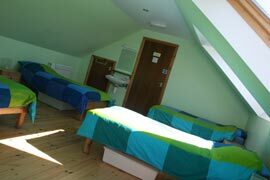 The original barn, dating back to the early 1900’s, has been converted into a light and airy hostel with central heating throughout. There are two large dorms each with six single beds, and two twin rooms each of which has a double bed with upper single bunk. All bedrooms have wash basins. 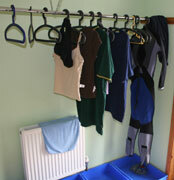 Opposite the showers and toilets, there is a laundry/drying room with a washing machine and wet-suit drying area. 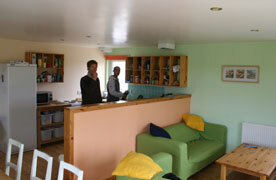 The kitchen/dining/lounge is open plan and a focal point for hostelers, with a television, books and board games. 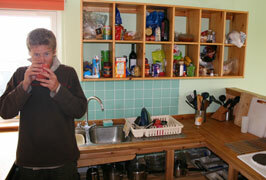 The kitchen area is very well equipped including oven, eight hot plates, microwave, fridge etc. 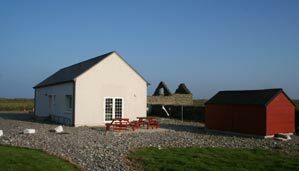 Patio doors open onto a paved area with picnic tables…an ideal spot to listen to the elusive corncrake on summer evenings as the sun goes down. Also outside are a bike rack, wet suit rack, and clothes drying line. 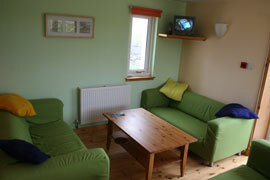 Dogs are not permitted at the hostel.